With the holiday season past us, in our hometown of Minnesota we are just waiting for the weather to warm up. But with the holidays still in fresh in our minds, it is a good time to think about adding a big screen TV to your holiday event. People are always looking for fun things to do with friends and family during this time, and renting a Jumbotron screen can bring your Christmas or other holiday event to the next level. 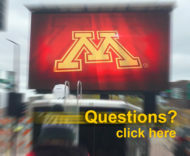 There are many uses of the LED video for these events. One way could be to use the screen to create an interactive experience with Santa talking to your guests on the big screen. We can also display the live Santa tracker to show where he is on his trip to bring gifts to everyone. The video board can also display Christmas and holiday movies for viewers. And of course any other for the screen, including sponsor vidoes and logos, a look in Santa’s workshop, live video, a yule log fireplace, slideshows, social media feeds, event info and announcements, and more. We have several different screen options for all event sizes. We can set up our mobile screens in multiple locations depending on the layout of your event and how you plan to use the screen. There is also advertising space around the screen for banners, the perfect location where guests will already be looking. 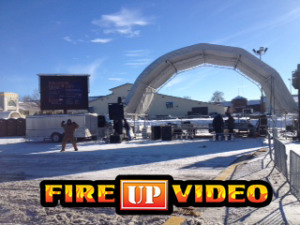 Fire Up Video provides mobile LED video walls for events all over the Midwest, including states such as Minnesota, Wisconsin, Illinois, Michigan, Tennessee, Kansas, Missouri, Indiana, Ohio, Iowa, Kentucky, Nebraska, Colorado, North Dakota, South Dakota, and more. For more information, please contact us at 612-759-1012 or baum3@earthlink.net.